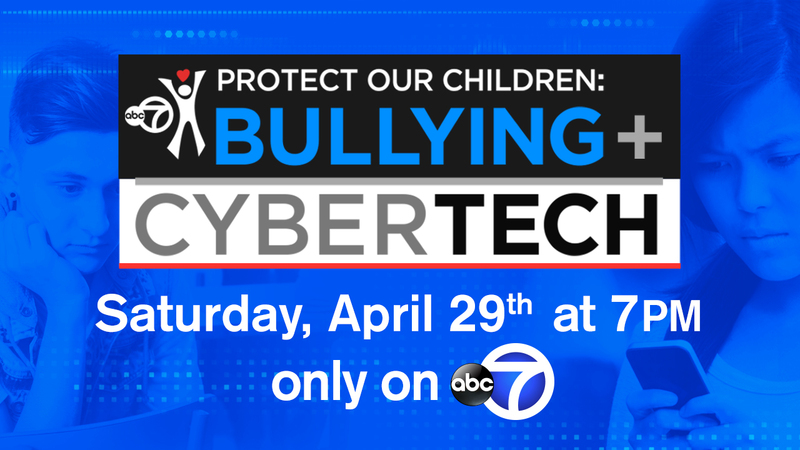 NEW YORK -- On Saturday, April 29th, WABC-TV will air a special entitled, "PROTECT OUR CHILDREN: BULLYING + CYBERTECH" at 7:00 p.m. (Also to be re-run Sun. 4/30 at 5:30 a.m.). The program is hosted by Eyewitness News Anchor, Diana Williams, and addresses the fact that in schools across the country, educators are seeing a dramatic rise in bullying. New York City schools report that Cyberbullying has increased a whopping 351 percent in just two years. Here are resources featured in the special report. And below, find out more about what's in the broadcast. When you're a child, being different in any way is tough. The Special features a 19-year-old transgender male who experienced such severe bullying and harassment he ended up dropping out of school and engaged in what is a predictable pattern of self-destructive behaviors. With therapeutic support from the Adolescent Health Center at Mount Sinai and help from his family, he was able to establish his new identity and receive the care he needed to move on with his life. A large share of bullying unfortunately focuses on the difficult issues of race, obesity and sexual orientation. Trying to combat these problems, schools are increasingly innovative with their approaches. We feature an Anti-Bullying Club at Garden City Middle School in Long Island where students have attacked this issue from every possible angle, whether it is the "No One Eats Alone" campaign or quilts and graphics that make the point. The Leaders High School, which is part of the NYC Outward Bound Schools, has a peer mediation program, we featured four years ago. We returned to see how they were doing, and witnessed a Mock Mediation, used to train future Peer Mediators. Their positive results are reflected in their recent statistics and are impressive to say the least. We also feature the Urban Assembly Media High School that has a slightly different approach to bullying that they refer to as their Resilient Scholars Program. They weave social and emotional learning into their curriculum and the incidence of physical conflict and suspensions has been drastically reduced. With the kids of today so deeply immersed in social media, even getting a concussion now presents a whole new set of concerns, both physical and mental. A young 12-year-old was treated at Overlook Medical Center's Neuroscience Institute and he experienced first-hand the difficulties of staying away from electronics and LCD screens, the use of which can double the recovery time in patients. It's hard enough to be deprived of social media in this era, but literally the resulting headaches generated his desire to self-regulate the use of these devices. This special is the twentieth in a series from WABC-TV's "Protect Our Children" campaign that originated in 1998. The campaign includes informational safety messages, a web site and campaign that continues to broadcast the pictures of missing children in every Eyewitness News Program. The previous Specials have received six Emmy Awards, six "Gracie" Awards from the American Women in Radio-TV-Film (AWRT) and Awards from the National Center for Missing and Exploited Children, (NCMEC). All of the segments along with additional material, web-chats and links to resources and agencies that can be of help will be posted on ABC7NY.com/Protect after the airing of the program.